When he was five, Jared Muralt’s mother took him to India. He saw huge wooden fishing boats come ashore on the beach, their nets full to bursting with unimaginable creatures from the deep. And he sat there for hours and drew – the catamarans, the catch, the sharks, all of it. Now, aged 32, his work is still peopled by mighty oceans, boats, fish. Sitting at his desk, Jared Muralt looks out over the Aare, flowing through Bern on its way to the North Sea. But his longing is for the ocean. In his youth he fed this yearning with books like «The Old Man and the Sea» by Ernest Hemingway, or «Twenty Thousand Leagues Under the Sea» by Jules Verne. In 2012, Jared Muralt began to draw deep sea anglerfish. It started off as an exercise in the technique known as stippling. As time wore on, Muralt was drawing one of these extraordinary creatures every morning. Yet again he found himself sitting for hours on end, pen in hand, capturing what had been disgorged from the deep. The result was a collection of over 100 illustrations. Muralt’s meticulousness and attention to detail place his drawings in the tradition of scientific illustration. 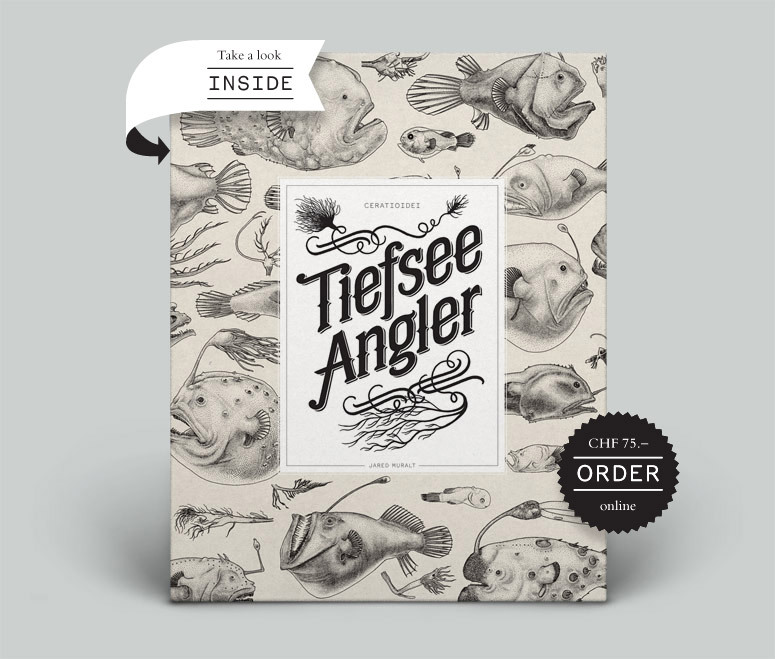 Though «Deep Sea Anglers» makes no claim to be a scientific work, it is still the first volume ever published to contain uniform illustrations of this group of darkness-dwellers. Jared Muralt was born in 1982 in Bern, Switzerland. Though he attended art school for one year in Bern, Muralt is primarily self-taught, and he developed his precision and skill through the careful study of books as diverse as those pertaining to anatomy, art history and comics. Muralt works as a freelance illustrator since 2006 and is also co-founder of BlackYard studio, a Swiss illustration and graphic design agency that was honored with Bern’s Advancement Award for Design in 2009.